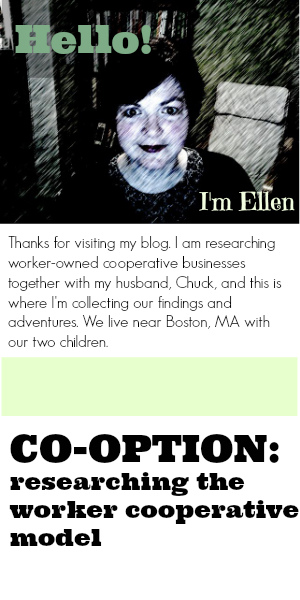 CO-OPTION: researching the worker cooperative model : What Does a Worker-Owned Cooperative Cafe Look Like? What Does a Worker-Owned Cooperative Cafe Look Like? Welcome! I invite new readers to begin by reading my earlier posts. You'll see links over there on the right-hand side. I have been thinking about the idea of a worker-owned cooperative coffee shop/cafe, and if such a thing could work where I live. I figured there must be some already in existence. Sure enough, after some online research, I came upon Local Sprouts Cooperative in Portland, Maine. I made an appointment to meet and chat with one of its worker-owners, Jonah Fertig, in October 2013. Portland is a coastal city, population 65,000, and has a reputation as a “huge food town”, Jonah told me. In 2009 Bon Appetit named Portland America’s “foodiest small town”. It has been said that it has the most restaurants per capita after San Francisco. Local Sprouts Cooperative evolved out of the Peoples Free Space, a community organization in Portland, which formed in 2002. Jonah is a long-time community organizer with a background in food and teaching. With others he began a catering business in a shared kitchen at the Public Market House with offices at The Meg Perry Center. The goals were to build a sustainable local food cooperative and to create jobs utilizing local organic food. They incorporated as a worker-owned cooperative in 2008. After about a year in business, they saw space for rent on Congress Street, a former University of Southern Maine dormitory. The space had a kitchen. In 2010, with the help of about 200 volunteers who renovated the space, the Local Sprouts Cooperative opened, with a community cafe, offices and a large commercial kitchen. How was all of this possible, financially? They applied for and received a community development block grant from the City of Portland, as well as a loan from the Cooperative Fund of New England. They also sold memberships and got direct loans from friends and family. Local Sprouts now has 20 worker-owners with the equivalent of 19 full time jobs. There are also part-time workers. New hires are brought on with the understanding that after a two-month period as a working “seedling”, they will buy into the cooperative. The cost to become an owner is $500 (cash or payroll deduction) plus 60 hours of sweat equity within the first year. The coop is run by four primary committees on which the worker owners serve. Decisions are made by consensus. They hold monthly all-worker owner meetings and committees meet once a month. There are written agreements about how a worker-owner can leave and how they can get back their investment. After our 90-minute conversation, I stayed for a bit of lunch. I ordered a cup of southwestern veggie soup served over rice, and a chocolate chip walnut granola bar. The cafe was still bustling well after the lunch time rush. The kids play area awaited its next guests. I sipped my mineral power tea, admired the art on the walls and the Maine Food Map, which shows where different farms and food producers are located. The Rolling Stones played over the sound system. So, what does a worker-owned cooperative cafe look like? It looks like a cafe! But how it was formed, how it operates and who benefits is what sets it apart.